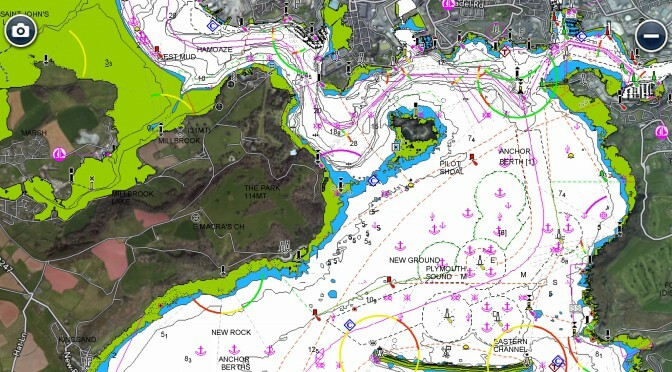 I’m traveling back from Plymouth having, early this morning, completed and passed my RYA Yachtmaster Coastal exam. It’s been a tough week with challenging weather that limited the preparation somewhat. On reflection I think I enjoyed the exam but at the time that wouldn’t have been the right word. I felt pretty stressed throughout the 8 hours and under a consistent pressure throughout. I’ve been sailing now for three years and have logged around 1,900 miles and 60 days. I’d suggest that working for me was the relatively highly proportion of that time as skipper. I’ve also benefited from great instruction and crewing on a preparation course last summer. I choose Plymouth because I’ve never been there before (other than a corporate jolly to watch the Americas Cup, but that was more champagne and canapés than tank water and pizza). It was important for me to earn a pass in unfamiliar waters (which is what a coastal skipper will be doing) and also to avoid taking shortcuts, and possibly make mistakes, in the Solent which I know reasonably well. I arrived at the sailing school Sunday night to find our Bavaria 34′. Smaller than anything else I’ve been on she had standard reefing, a large furling genoa and a working jib that could be hanked onto an inner forestay in very strong winds. We used this sail all day on Monday in F5 gusting F7. Crewing with me were another Yachtmaster Offshore candidate and a Yachtmaster Instructor candidate getting ready for his course the following week. They had logged 2,600 & 35,000 miles respectively – we’ll call them Dan and Ashley to protect their anonymity. 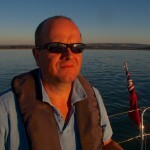 Our instructor has been an RYA Examiner since 1985 – things were looking good. The weather let us down and most of our 4 days were spent with 2 or 3 reefs in although the cloud cleared for a delightful night pilotage from the Tamar Bridge into the Sound, around the breakwater and back to base. I thought we had lucked out but there was more rain and strong weather on the last prep day, the sun finally breaking through just three hours before my 6pm exam. The examiner was ex military and explained how he was looking to assess my command and control of a sailing vessel in a variety of situations and that we should be done by 2am unless he felt he needed to explore some other aspects. That put me completely at ease! He explained that for all the primary handling tasks everything would be done under sail – man overboard, anchoring, picking up a mooring buoy – fair enough. First task, take the boat out and anchor in Cawsand Bay under sail, picking up a mooring buoy along the way. He marked a spot on the chart and said “In your own time”. I asked if he wanted a safety briefing which he declined and said he’d pick something in a briefing, like a life jacket, and ask me to tell him all I knew about it. 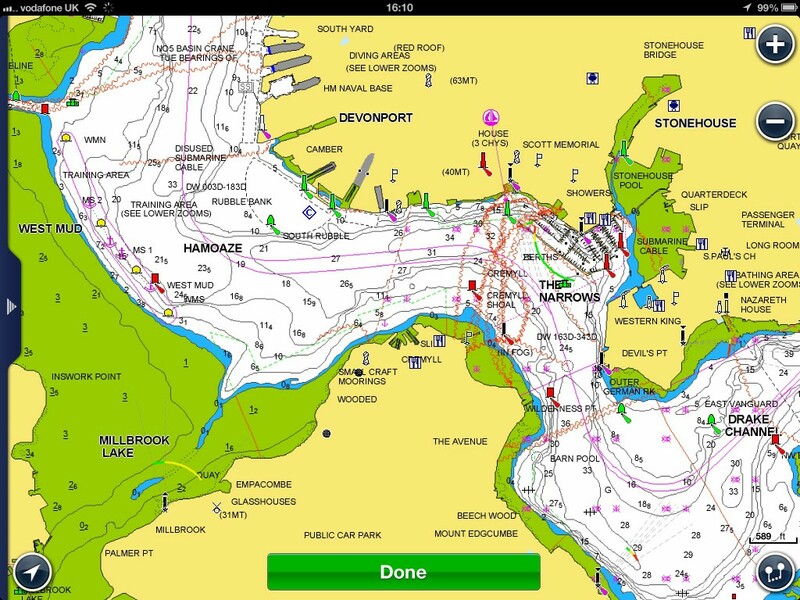 Departure was uneventful, and we motored calmly down the River Plym towards Plymouth Sound. I knew the wind picks up in the Sound so left one reef in and let all the genoa out. I got ready to line myself up for a coast into the buoys opposite Queen Anne’s Battery Marina and Mountbatten Breakwater. I was just reminding myself we had practiced here earlier in the week when the engine stopped. It’s supposed to do that when I press the stop button and I hadn’t. What a cheeky examiner. The winds were very light but at least not variable and I did an okay job on lining up on a close reach, spilled the mainsail which de-powered and we were nearly stopped as we came alongside but Dan missed the lasso. He said “sorry”, I said “no worries”. I repeated the manoeuvre and once again Dan missed it. It was a pretty tricky manoeuvre due to the very light winds (2-3 knots) in shelter. The examiner said okay, I’m satisfied and off we went across to Cawsand. Later, in the debrief, he explained that the other boats were beam on to the wind and that the ebbing tide was determining their aspect. I came in on a tack with the tide and was never going to stop. I knew this, of course, I just didn’t consider it as I was absorbed with getting the boat to move in just a few knots. As we set off we struggled to get any drive but I was able to slacken off the halyard and clew outhaul and get her going. The sail across to Cawsand was the best sail all week. A lovely reach for 20 minutes at 7-8 knots and I even enjoyed myself, reassured that the examiner was down below gassing to my instructor rather than tying a fender and bucket together. The wind died as we rounded Picklecombe Point and I reverted to type suggesting the iron sail. “You’ve still got a reef in haven’t you?”. What an idiot. Reef shaken out and, low and behold, off we went. As we approached our target, the examiner said “Warp power has been restored captain” and I could motor in for dinner. I found our target waypoint, he confirmed it, and then we found a safe place to drop the pick. Now here’s the thing. The examiner says “find somewhere suitable” and you just think it needs to be close by – but it doesn’t. Five minutes away from those mooring buoys and the fishing vessel would have been a lot easier. I would not have chosen to anchor there, so why did I? It just made life difficult but the exam mentality encourages this even though he was explicit and was not tricking me in the slightest. So in 9m I dropped all our scope (we only had 17m of chain and about 20m warp) and drifted back with the fishing boat to leeward. Any shallower than 9m and we’d swing into the shore and moorings. So I announced “Sorry guys, I’m not happy” and Ashley hauled up the pick and I moved to a new, still not perfect location. I was fixated with the area. The wind was slack and I gambled on 30m total scope. The boat should have at least 30-40m of chain but it didn’t and I was a bit irritated by this. I’m positive the examiner didn’t notice I scoffed my dinner like I’d just got out of a Siberian concentration camp and then sat in the hatchway for air. I’m positive he didn’t notice me glancing occasionally to see if were drifting any closer to that blasted fishing boat. After a long diatribe on the merits and demerits of GPS he asked me to plot our current position on the chart. We were off by quite a bit on latitude which surprised me, as I double checked it. As I marked longitude I realised he had changed the GPS chart datum. What a cheeky examiner. “Oh, very clever” I thought – actually, I said it out loud. It did amuse me, as we knew he had a reputation for this trick and he did get me. About 3 cables error if you’re interested – in fog in the Channel Islands that could kill you. And so to fog. He asked me to find a specific buoy after plotting our actual position using a simulated blind nav. So I’m down below, I can’t see outside and the crew can tell me nothing about what they can see – obviously no GPS. They follow my instructions and the examiner will announce anything he thinks we would see. He said after we found it, we’d do a standard night pilotage to a tributary off the Tamar, and to leave when I was ready. That was my clue to get the main pilotage sorted while at anchor and not when the boats’ bobbing around risking making me seasick. It took 15 minutes to write down my plan – I should have taken 16. My plan was to exit due east and pick up the 10m contour and follow it to a buoy as my next mark. 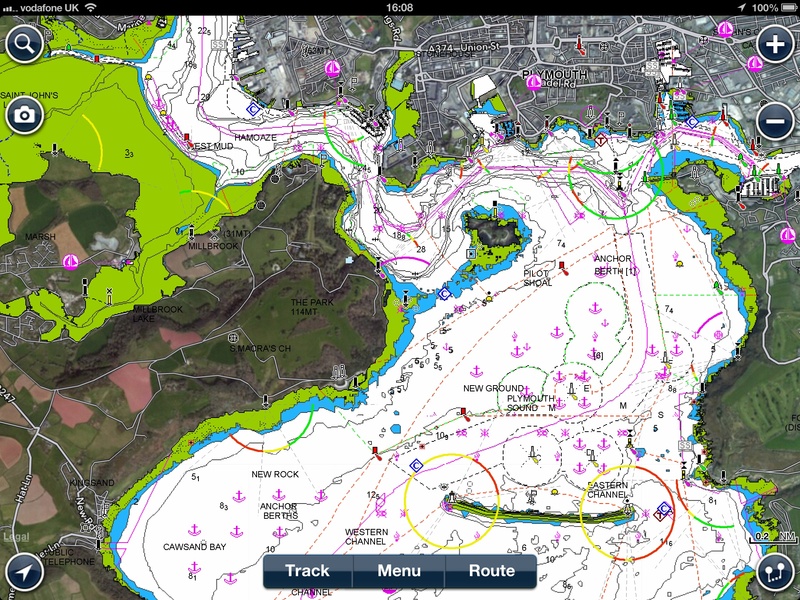 I checked and double checked the tides and instructed Ashley to find 13m on the echo sounder and follow it at 4 knots. I had a boat speed and depth repeater down below so I could keep telling him that he wasn’t doing it perfectly. Actually he was very good, and so he should be with 500 hours of night helming in his log book. That’s why I picked him. I was marking 4 cables every 6 minutes on the chart with log and time, and expected to meet the first buoy in around that time. And we did – the examiner announced a red glow off to starboard and Ashley motored to it where we confirmed it’s light characteristics. Depth was 14.5 – that felt like a big error. The contour thus far was nice and clean, a long sweeping curve with one blip along the way. The remaining line was all over the place until just before the buoy. Even Ashley couldn’t follow it and there’s no way I could measure off the distance using dividers. We had arrived late which I attributed to tidal offset. There’s no Tidal Stream Atlas on board and it’s very difficult to predict as it swirls around the headland, so at least now I had my delta of about 1 knot. I thought of stemming the tide at the buoy but the log on this boat is apparently terrible when less than 2 knots. “Ashley, steer 065 at 5 knots”. New Ground is exactly 4 cables away so we stopped short and then found the contour. My reasoning was if we missed it by more than 20m I wouldn’t know if we had over or under shot it. So, like finding a harbour I took us to one side of it and then traced it there. The examiner thought it was a sound strategy and told me it had been dead on the bow if I was interested. Depth still 14.5m which was weird. The night pilotage was fairly uneventful. I had a bit of trouble finding the first waypoint, mainly because we set off early and didn’t follow my heading for a little while, but the sectored lights in Plymouth are excellent. As we approached East Vanguard, I told Dan – now on the helm – to now head directly to West Vanguard, and he looked at me as if he was about to die. I checked my notes and the chart, and they said via East Vanguard. Dan who has excellent local knowledge later said, “You just don’t cut inside there”. That’s why I chose him. Turning starboard from West Vanguard we quickly spotted the sectored lights towards Mayflower Marina. A power driven vessel was coming down the channel on a steady bearing and Dan asked what I wanted to do. There’s definitely a lot less traffic in Plymouth than the Solent where you are constantly making these decisions. “Stand on”, as we continued on the white sector and at about 150m his starboard aspect turned into port aspect as he made his move. The police launch passed us a couple of minutes later. The entrance to the tributary through Saint Johns Lake was difficult to find just 1 hour before low water and the lake dries. It’s about 50m wide and completely unlit. We followed a back bearing from South Rubble for about 0.5 miles. Dan held a pretty good course perhaps a few degrees south of it. We slowed down a bit and started looking for the red buoy in the pitch black using a powerful torch and someone commented “I think that’s mud” a couple of boat lengths ahead and we turned sharpish. The feedback from the examiner was that I should take the helm in those situations as I can feel my way along the bank rather than call out instructions that can, at best, only be interpreted as what I wanted. The best way to approach, I later realised, was to find the unlit yellow in safer water and then find the channel buoy. Once inside I was relieved when the examiner said okay “Don’t bother driving up the river to the second, find somewhere to anchor and we’ll talk engines”. It’s only 40m wide and was dredged to 1.7m in 2006 and we only had 1m left of the falling ebb. He asked me my plan and said I want find 5m. He challenged me why I needed 5m and I said I had 1.85 draft, 1m of tide and a metre of clearance. If I laid 20m of scope i could easily drift into shallower water. It wasn’t a trick question and I think he understood my rationale. Again though, I fell straight into the trap thinking here had to be the answer, whereas the right place was back out in deeper water a long way from the moorings. I did think, though, that 5m might be too safe and found somewhere nice at 4m. My instruction to my manual windlass, Ashley, was given before coming completely to a halt and we settled at 2.9m. We would ground out in about 30m so we hauled it up and moved back. The examiner asked me what I knew of the fuel system and to describe the flow from start to finish pointing out all the components inside the engine bay. I got that right and he asked Ashley to switch it on. “Switch it off in there please”. I hadn’t been shown that but spotted a likely candidate. There was a cable lever that might be the accelerator. If I pushed it gently and the engine revved no harm would be done. I did so and nothing happened so I pushed a little more and the engine cut out. I looked round as if to ask “What next?” and he said “Well done”. He asked me to talk through in some detail how to bleed the fuel, about differences between gearbox oil for sail drives, where the alternator was, identify all the pumps, how to change the impeller and to walk him through the cooling system in detail. He concluded saying I knew a lot more than the average candidate does (a couple of these I just said I didn’t know rather than guess). Other than my instructor, we all learnt a lot in that half hour session. I was surprised how much detail on the engine the exam went into – by far the biggest theory topic. He made a really valid point that the more sailing you do then sooner or later you will have a problem. I’m definitely taking the RYA Diesel course next season. The crew piloted us back while we stayed in the saloon and went through my pilotage plan, COLREGS, weather charts and log book. I knew my lights very well but I was tired and I got a couple of the more obscure ones wrong. The crew announced our arrival at the marina and the examiner said “You’re doing well, just don’t mess up the parking.” That was a pretty big hint that I’d fail only if I messed this up. The examiner and my instructor were gassing away just in front of me on my final approach and I was just about to ask them to be quiet when they did. His only feedback was that when the crew have the lines secured I don’t have to stay holding the helm like a comfort blanket, but go and direct the crew. He shook my hand and said I’d passed. Took me back to when I did my Yachtmaster Offshore! Always a ‘fun’ experience! 🙂 I’m looking for volunteers to sail with us at Mórvargh Sailing Project in Plymouth on our 57ft ketch ‘Helen Mary R’ if you’re interested? I’ll send you an email directly. Will depend on timing and work commitments – thanks for the offer.